Senator Grace Poe has called her rival presidential candidate Davao City Mayor Rodrigo Duterte on Monday night, May 9, 2016 to concede. Based on partial and unofficial results, Poe has dropped from second to third place, garnering 7.6 million votes. As of midnight, Duterte has 13.4 million votes. Reports said the lady senator called Duterte over the phone to congratulate him. She also introduced an "electoral agenda" to the incoming president. 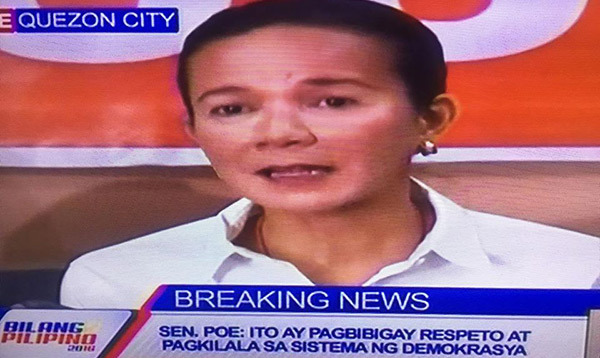 In a press conference, Poe said she congratulated Duterte and is giving way for the city mayor's victory. She vowed to support Duterte's administration.